Decorating custom apparel is 100% our Monkey Business! If you can wear it, share it and/or stare at it, chances are MIAD can print it, embroider it and essentially customize the heck out of it. We offer a 100% satisfaction guarantee. Whether you need custom screen printing on T-shirts, Hoodies or Bandanas, or Custom Embroidery on Sweatshirts, Polo’s or Hats, we have 1000’s of products available to choose from, including the most fashionable, flattering and stylish t-shirts for women. Our most popular women’s t-shirts are from the Bella+Canvas and Next Level Apparel lines. Both offer fashion forward designed t-shirts for men, women and youth. We do Monkey business around the country and across the road for individuals, teams, groups, companies, movements, bands, rebellions, causes, events and whatever you have in mind. We offer Free Shipping on all orders from Coast to Coast! From California to New York and everywhere in between, MIAD has you covered! Contact us to learn more about placing a custom screen printing order. We are serious, highly trained, extremely experienced, supremely skilled pros who thoroughly enjoy what we do. 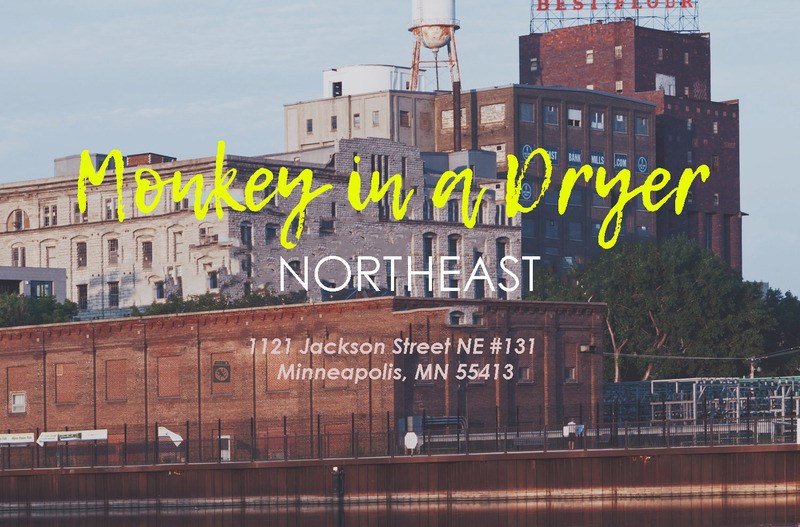 Monkey In A Dryer started 15+ years ago in a South Minneapolis basement as a “why not, it’ll be fun” experiment. Well, that experiment was a Kong-like success and fun absolutely remains an essential MIAD component. Monkeys live in communities called troops. At Monkey in a Dryer, we are a troop that extends to our neighbors, our vendors, our partners and of course, our customers. All is better when done in community with integrity, honesty, concern for others and a killer backbeat. We don’t just print custom t-shirts, we like to think that we help spread a positive message, one t-shirt at a time. Our mission at MIAD is to do amazing work for a fair price and to be the best neighbor we can possibly be. Welcome to our troop. To learn more about getting your custom t-shirts screen printed or your custom embroidery services done in a flash, contact us today! We are located within the Waterbury Building in the historic arts district of Northeast Minneapolis, Minnesota and proudly serve all of the Minneapolis/St. Paul area and ship products to customers nationally from coast to coast.